An old article from the UK's Daily Mail, but if you ever wondered why your British friends get a little teary eyed during November...this lovely article will tell you why. Where have all the Guys gone? QUENTIN LETTS'S nostalgia for the fantastic Bonfire Night effigies of yesteryear. 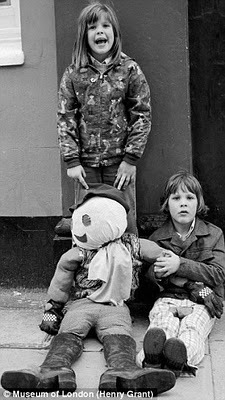 My cousins and I used to do this every year during the late 1970's in Derby. Shamelessly 'begging' for pennies on the High Street, or outside the Bell & Castle Pub with our homemade guys. Cheeky, but wary of the adults that paid a bit too much attention to us, ready to run off giggling if we got moved on. When we got enough in our pockets off to the chippy we went, or the corner shop for sweets. Love these old photographs... getting a little teary eyed myself.